There is a vital link between being able to honestly confess our sins, faults, and failures in the sight of God and to being equipped to proclaim the Gospel. It is right that these lines are so similar. Both proclaiming the Gospel and confessing our sins are works the demand of us an obedience to the Lord and that we lay aside our pride and vanity. It is impossible to honestly confess our sins with prideful hearts and it is equally impossible to truly proclaim Good News without knowing ourselves forgiven by Divine Mercy. Confessing and Proclaiming both find their root in the heart of the Christian faith – our acknowledgment of the glory of God and the vital presence of his gracious love. Confession and Proclamation are at the heart of the Christian message – we are truly sorry, we humbly repent, we are forgiven by the Lord who came into the world to save sinners, and we can’t help but proclaim that grace boldly – full of thanks and praise for God’s unfailing mercy. Our whole ministry as Christians is bound to the reality of God’s forgiveness – to the washing away of our sins in the flowing waters of baptism. Confession and repentance make proclamation truly possible. John Macquarrie writes, “Sin, or rather the conviction of sin, is the presupposition of baptism. We have a sense that all is not well with us.” We are washed from sin in Baptism – Yet, we also recognize the reality of sin in our lived Christian experience. How do we hold onto that centered place in which we find ourselves at one with Christ, literally donning Christ at the font? It is impossible to talk about the dust of Ash Wednesday without pondering that which washes away the dust – water. It is the water of baptism that washes away mortality and gives us the knowledge that no stain, no mark, no failing, no pain, no sin, and no death lies beyond the power of the waters to wash away. 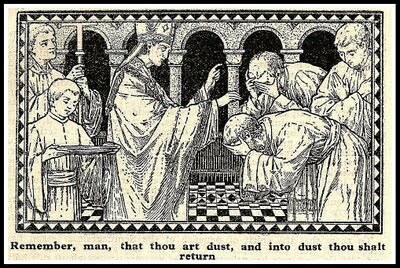 Over this dust we say, “…Grant that these ashes may be to us a sign of our mortality and penitence, that we may remember that it is only by your gracious gift that we are given everlasting life…” Blood and Water wash away the dust and leave in their wake a new creation. No Sacrament can be thought of in isolation from the rest of the Christian Sacramental life. To do so is to impart a magical quality to the moments rather than framing them in the totality of belief, practice, life, death, hope, regret, grace, and pardon. This dust is a sign – it is not a Sacrament. It reminds us of brutal realities. It points toward sin and death. But it is a sign alone full of meaning yet not binding us by its mark. It is not the end of the story but a mark of a new beginning. We will fail God at times. We will die. And then the Sacrament does its work – for when dust claims us, when we go down to the grave, it is then that we find our fulfillment as the waters of Baptism wash away the dust and we rise anew – forgiven and transformed. The dust points toward our death to sin and new life in Christ who bears our sins. Each Sacrament must be taken as part of the whole of the experience of Christ’s presence in and with us. Baptism, that moment of washing and donning, cannot be a moment but must be at once a beginning and end of the migration of lived Christian pilgrimage. Our entirety is baptized. Every aspect of our lives is knit to the divinity. Confession and repentance are means by which we can keep our Baptism in front of us as we walk. They are the recognition that sin, washed from us at Baptism, still enters the Christian life and dims the awareness of the fullness of Christ’s indwelling. Repentance makes the unobservable and the easily avoided more concrete so that we also feel and know the reality of the grace of Baptism. Sometimes penitence takes on a dismal quality. It is never fun work but we too often find folks who seem to revel in the self-abnegation of Lent and the self-flagellating of confession. The problem with this approach is that it is no less self-centered than a wholesale and ultimately empty affirmation of the narcissist. “Look how awful I am. Look how wretched I have been. Look how grievously sorry I am!” Note the Gospel! Lent is not a call to gross acts of self-abasement – it is a call to honesty. To honestly see our faults. To honestly ask for forgiveness. And to honestly believe that our sins are put away – that we are forgiven, that we may walk in newness of life. Anglicanism, at its best, is a tension of commendable impulses. We balance, healthily, the joy of Easter with the pain of Good Friday. We are not an Easter people alone nor are we a Church that grinds the penitent down with the guilt of Good Friday. We know that the fullness of the Christian life is revealed in all of these moments and more. Easter makes little difference without Ash Wednesday. Without its reminders of our mortality and failings – the joy and redemption of the Resurrection make little real sense (not that they ever truly do which is part of the profound blessing). Repentance and Confession are just another exercise in self-obsession if they are not done with the promise and forgiveness of the empty tomb to look toward. Confessing our sins is not about us – it is about the other. It is about God. Confession is the willingness to accept the forgiveness and mercy of God, so that we may love God with all of our being, and grow in love and charity toward our neighbor. Not because it is simply a kind thing to do but because we are called to mirror the love of God – to be perfect as our Heavenly Father is perfect – and to know we will fail and be called to confess and to strive anew. The kind of Confession that dwells solely on our faults, our own faults, our own most grievous faults without a deep desire to see our relationships healed by grace is ultimately unhelpful for it rests on us. What we do. What we don’t do. These are crucial things to be aware of but they are not the full story of Ash Wednesday – for the dust is washed away. Confession is a Sacrament of the future – restoring hope rather than simply punishing transgression – it is not a Sacrament of judgment alone but of restored souls and renewed relationships. It reminds us of our whole saved being whose nature and hope is found in the One identity we all share as the Body of Christ. Confession only makes sense in light of our many, many relationships as our souls and bodies, are drawn ever closer to God and ever closer to our Baptized self – so that we can be a sign of God’s forgiveness to others as well – so that we may worthily proclaim His Holy Gospel as others perceive within us the fruits of Christ’s redemption. A healthy and holy meditation on the reality of sin and the greater reality of God’s grace in Christ Jesus. The General Confession in the 1928 BCP drew me to the Episcopal Church since the church of my childhood, the Disciples of Christ, had no confession of sin in Sundayh worship. Saying the confession of sin at every liturgy in the Episcopal Church was a form of reality therapy for me–as you say, Fr. Robert, an exercise in honestry. A respected member of my first congregation questioned the need for the Confession of Sin by saying that she did not need it. I suspect that’s not an uncommon attitude in these days of minimizing the reality and destructivenss of sin by both our culture and the current liturgies and theologies of mainstream churches. The General Confession remains a rich mine for truths essential to spiritual health and holiness. Robert – Very good homily! It fed my soul, which frankly few do these days.